The ancient Chinese believed that good fortune and misfortune were the result of spirit intervention. Evidence from the Zhou (Chou) Dynasty (11th Century - 221 BCE) indicates that the Chinese dealt with evil spirits in the same way they dealt with their human enemies. Several times a year and during solemn occasions, swarms of exorcists would run through the streets shouting and thrusting their spears in the air to expel the evil spirits. Additionally, human prisoners were dismembered outside the city gates as a signal as to what would be the fate of any evil spirit that dared enter the city. Since ancient times, the Chinese have believed that Chinese characters have a magical power to influence spirits. According to the "Book of Master Huainan" (淮南子), when Cang Jie (仓颉) invented Chinese characters during the reign (circa 2698 - 2598 BCE) of the legendary Yellow Emperor (Huangdi 黃帝), "millet fell from the sky and the spirits cried at night". This was because the spirits were afraid of being controlled by the magic power of Chinese characters used for amulets and charms. It seems to be almost universal that the art of writing evokes a magical power in populations which are mainly illiterate. At least from the time of the Han Dynasty (206 BCE - 220 AD), people wore charms or amulets on their waist or around their necks for protection (see pendant charms). 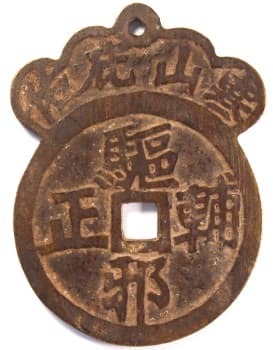 These talismans often carried an inscription requesting a Daoist deified person, such as the "God of Thunder" or Lao Zi (also known as Lao Tzu and considered the author of the classic Taoist text Dao De Jing (Tao Te Ching 道德经)), to "expel" evil influences and "kill" demons, and also to "send down" good fortune and happiness. 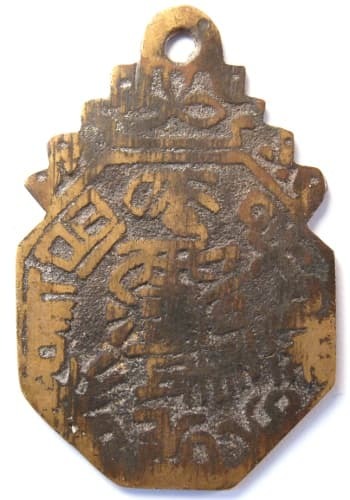 Because these inscriptions frequently requested the God of Thunder (Lei Gong 雷 公 or Lei Shen 雷 神) to use thunderbolts (ting 霆) to kill the bogies or evil spirits, these amulets are often referred to as "Lei Ting" (雷霆) charms or "Lei Ting curse" charms. Under the rule of Chinese emperors, official documents, including mandates and decrees, carried absolute authority. Such influence further fostered the belief by the common people in the power of Chinese characters. The Daoists were able to transfer to the spiritual world this concept of absolute power over people and the magical power of the written language. Thus, the inscriptions on amulets and charms resembled official imperial documents of the time. The amulet would request that a "command" be issued from a "high official" to the "evil" spirits or bogies. The command needed to come from a deified "high official" with the prestige and power necessary to enforce the order. Frequently, this spirit was the God of Thunder with his arsenal of thunderbolts. Sometimes Lao Zi (Lao-Tzu 老子), the founder of Daoism (Taoism), would be asked to intercede. The amulet inscriptions would request that the evil spirits be expelled or killed. The inscription or legend would usually conclude in the same manner as an official government order with words such as "respect this command" or "quickly, quickly, this is an order". A couple of the charm inscriptions displayed below conclude with the expression "let it (the command) be executed as fast as Lu Ling." Lu Ling was a famous runner in ancient China. Daoist magic writing (fuwen 符文) is also known as Daoist magic script characters, Daoist magic figures, Daoist magic formulas, Daoist secret talismanic writing, and talismanic characters. These are symbols with twisted strokes that sometimes resemble Chinese characters. Only Daoist priests can read and understand this magic writing and the characters can differ from sect to sect. Their method of writing is passed down secretly from master to disciple. If magic writing were easy to understand then anyone could have the power to control the spirits. The origin of "magic writing", according to such ancient Chinese texts as the "Records of the Divine Talismans of the Three Grottoes" (三洞神符纪), is from the condensation of clouds in the sky. Some magic script characters appear to have been formed by stacking one Chinese character atop another and making them into a single character. This technique of linking or combining characters was used not only by the Taoists, however, since it also appears on other types of Chinese charms and woodblock prints. "Magic writing" symbols are usually placed at the beginning and end of the inscriptions. Several of the Daoist charms below display "magic writing" characters and translation is provided when known. This is a very large and nicely cast specimen of an old Daoist charm. The central hole is round as opposed to square. The large characters at the extreme right and extreme left are not Chinese but rather Daoist "magic writing". While Daoist priests would like for the meaning to be kept a secret, these particular magic writing characters can now be understood. Regarding the very large character on the left, the upper half is "magic writing" for the Chinese character lei (雷) which means "thunder" and refers to the "God of Thunder". The lower part is "magic writing" for the Chinese character ling (令) which means "to order". The top portion of the very large character on the right, consisting of what looks like a three prong fork with three small circles underneath, is the magic writing equivalent to sha (杀) which means "to kill". The part of the character below the three small circles is the Chinese character gui (鬼) which means "ghost" or "spirit". The inscription of the two magic writing characters, read left to right, can thus be translated as the "God of Thunder orders the demons to be killed". "God of Thunder (Lei) clear out and kill the ghosts and send down purity. Behead the demons, expel the evil and keep us eternally safe. 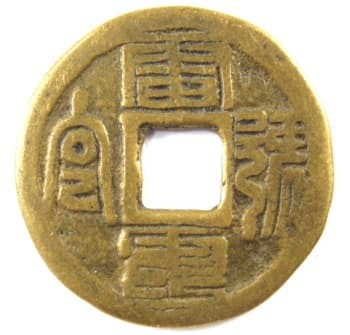 1 The title Tai Shang Lao Jun (太 上老君) was bestowed upon Lao Zi (老子) by imperial command in 1013 AD. I still have some doubts, however. The person looks like a young woman to me and Liu Hai is a male. Also, all the other Liu Hai charms that I have seen always show the toad as having three legs and the picture here only shows the upper torso. 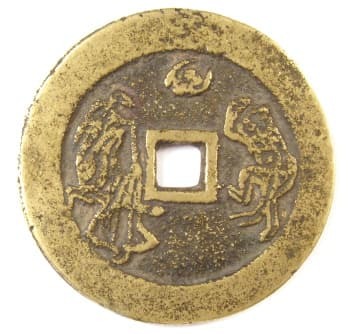 Additionally, the Liu Hai story usually associates Liu Hai using gold coins on a string to catch the toad in a well. In the scene here, there are no coins shown and the waves and bamboo would seem to indicate it is a river or stream. However, until I can find an alternative explanation, I will follow the consensus and present the charm as Liu Hai and the Three-Legged Toad also known as "Liu Hai playing with the Golden Toad" . This charm is 61 mm in diameter and 3.8 mm in thickness. 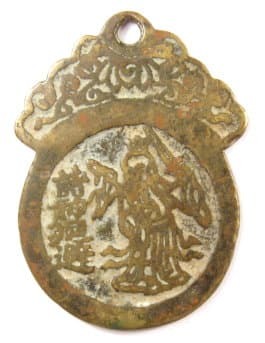 The obverse side of this Daoist charm is almost identical to that of the charm above. "God of Thunder (Lei) thunderbolts, God of Thunder thunderbolts, kill the ghosts and send down purity. Let it be executed as fast as Lu Ling.2"
2 Lu Ling was a famous runner from ancient times. He purportedly lived during the time of King Mu who became renowned for his chariot and eight outstanding horses. 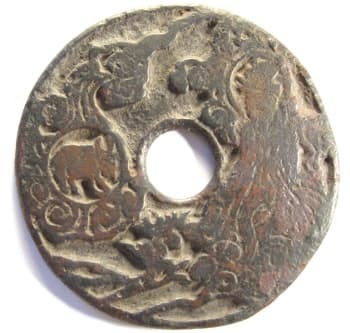 Please see Ancient Chinese Horse Coins for more information. The reverse side of the charm displays bagua or the eight trigrams. Bagua are frequently seen on Daoist charms and mirrors. For additional information, please see The Book of Changes and Bagua Charms. The charm has a diameter of 45.5 mm and weighs 25.5 grams. 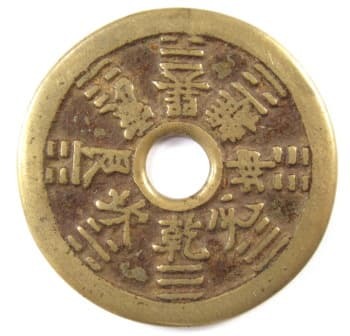 While this Daoist charm has a round center hole similar to the two charms above, it is actually quite different. The Daoist magic writing at the right and left are different from those above. Their meaning is unknown. Let it be executed as fast as Lu Ling.3"
3 Lu Ling was a famous runner in ancient China. This is the reverse side of the amulet. On the left side is Daoist "magic writing". Its meaning is unclear. On the right is the Daoist god Zhenwu (真武), also known as the Perfected Warrior. During the Han Dynasty (206 BCE - 220 AD), he was known as Xuanwu (玄武) and was depicted as a tortoise encircled by a snake. This symbol represented the north direction. Over the centuries this symbol gradually evolved and by the Song Dynasty (960 - 1279 AD) had developed into the very popular warrior god Zhenwu associated with healing and protection. We know this is Zhenwu because he is standing on a tortoise with a snake around it. This charm is well-worn but if you look carefully at Zhenwu's feet you will see an oval shaped object (tortoise). The head and neck of the tortoise is pointed towards the left at about the 5 o'clock position and about half way between the round center hole and the rim. Just above the head of the tortoise is the head of the snake. Above the center hole are the eight trigrams or bagua. In the middle of the bagua is the yinyang symbol also known as the taiji (see Hidden Meaning of Charm Symbols for more information). Additional information on the eight trigrams can be found at The Book of Changes and Bagua Charms. The charm is 44 mm in diameter and weighs 23.5 grams. 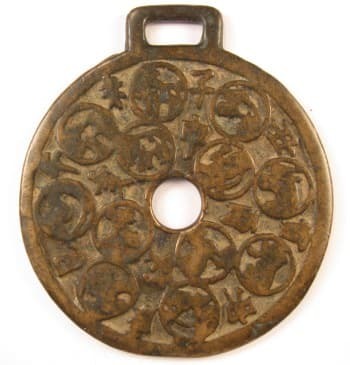 The Chinese characters on the obverse side of this old Daoist (Taoist) charm are in ancient seal script. The inscription, read from top to bottom and right to left, is lei ting hao ling (雷霆號令) which translates as "thunderbolt command". As is the case with the amulets discussed above, this is a request for the assistance of the God of Thunder. The reverse side of the charm is written in Daoist magic writing. The inscription reads yong bao shou kao (永保寿考) which may be translated as "to protect eternally and to enjoy a long life". This charm is 28 mm in diameter and weighs 4.75 grams. This old Daoist (Taoist) charm is distinctive because the inscription is written in both Daoist magic writing and Chinese characters. Each magic writing character has a Chinese character next to it. It is believed that the magic script characters have the same meaning as the Chinese characters with which they are paired. The inscription is fu shou yan chang (福寿延长) which translates as "good fortune and longevity for a long time". (A charm with a magic script character similar to the one on the left side of this charm is discussed in detail at "Quest for Longevity" Daoist Charm). 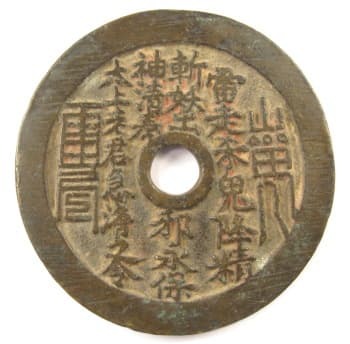 On the reverse side of the charm and to the right of the round hole is a "Star Official" (xing guan 星官), also known as the "Primal God" (yuan shen 元神) or "Primal God of the Northern Dipper" (bei dou yuan shen 北斗元神). The Chinese believe that this "star god" controls the life and fate of an individual. An individual needs to worship his star god for protection and to avoid misfortune. To the left of the round hole is a "cloud" with an "ox" (niu 牛) in the middle. This particular charm was, therefore, intended to be a good luck charm for people born in the year of the ox which is one of the 12 animals of the Chinese zodiac. The charm has a diameter of 50 mm and a weight of 29.3 grams. This pendant charm is unique in that it represents a syncretism of the major Chinese religions of Daoism and Buddhism. 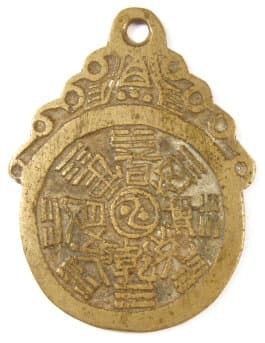 This side of the charm displays both Daoist and Buddhist inscriptions while the reverse side displays the "eight trigrams" (bagua 八卦) and the inscription chang ming fu gui (长命富贵) meaning "longevity, wealth and honor". This Chinese character refers to a "dead ghost" and its purpose here can be better understood by the following analogy. When a person dies, he becomes a ghost. People greatly dislike seeing ghosts. Similarly, ghosts are afraid when they see a "dead ghost" and will run away. The Chinese, therefore, believe that ghosts will be scared away if this Daoist magic character, meaning "dead ghost", is hung in homes or worn as an amulet. 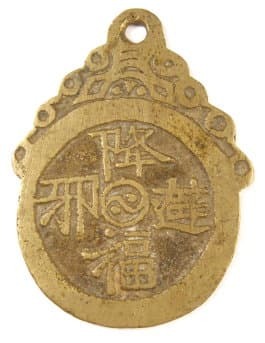 As mentioned above, this amulet also has a Buddhist inscription which is written along the rim. This inscription is explained in detail at Buddhist Charms. The amulet has a length of 49.5 mm, a width of 32 mm and a weight of 7.6 grams. 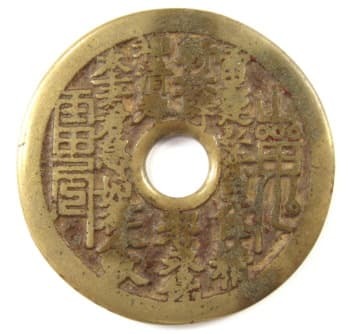 While this old charm has no inscription, it nevertheless tells an important story in Taoist history. To the right of the round center hole sits Laozi (Lao Tzu 老 子) holding a ruyi sceptre in his right hand. It is a little difficult to see but to the left of the hole is seated Zhang Daoling (张道陵). Behind Zhang Daoling is a tiger. The tiger's head is just to the left of the hole with the two front legs also showing. The tiger's rear leg is touching the left rim of the charm. At the very top of the charm, just below the rim, is the seven star Big Dipper Constellation with an auspicious cloud (yunqi 云气) beneath. Just below Laozi's feet is xuanwu (see Four Divine Creatures) which is a tortoise entwined by a snake that eventually evolved into the Daoist warrior god Zhenwu (真 武). To the left of xuanwu, with its head just to the right of the tiger's head, is a crane (he 鹤). According to Daoist tradition, Laozi, the founder of Taoism, appeared before Zhang Daoling on "Crane Cry Mountain" (hemingshan 鹤鸣山) in what is now Sichuan Province in the year 142 AD and proclaimed him a "Celestial Master" who was to deliver the people from the evils of the Han Dynasty. Zhang Daoling (also known as Zhang Ling, "Ancestral Celestial Master" and "Celestial Master Zhang") then established the first organized Daoist religious sect known as the "Five Bushels of Rice" ("Five Pecks of Rice" or Wudou Mi Dao 五斗米道). Each of the animals of the Chinese Zodiac is depicted in its own small circle with the entire group occupying most of the area of this side of the charm. The charm is quite worn from use over many years and, although it is difficult to make out from the pictures which animal is which, the Chinese character of the Earthly Branch associated with each animal is shown to the left of each animal. This charm is 64 mm from top to bottom and 56 mm in width. 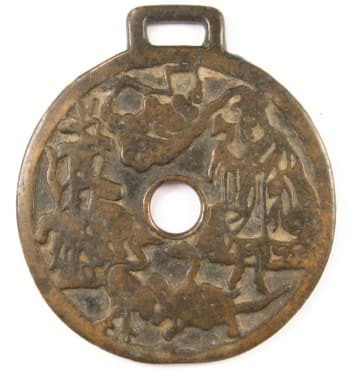 This old Taoist (Daoist) charm has a single loop at the top and displays two of the "Eight Immortals". 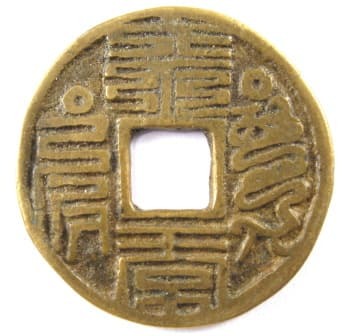 The obverse side of the amulet depicts Lu Dongbin (Lu Tung-Pin 吕洞宾). In his left hand is his magic devil-slaying sword which can slay any ghost or demon. In his right hand is a whisk (fly whisk) which allows him to walk on clouds or fly to heaven whenever he wishes. The inscription, read top to bottom, reads as zhu shen hui bi (诸神回避) which translates as "evade all the spirits". At the very top of the charm, just below the hole, is a lotus. 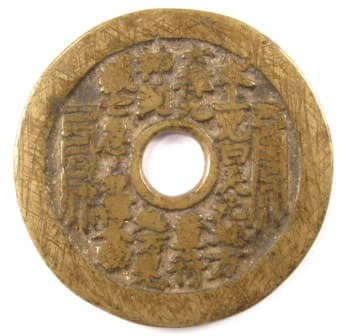 The Chinese word for "lotus" (lian 莲) has the same pronunciation as as the word for "continuous" (lian 连) so the hidden or implied meaning is that the inscription on the amulet should continue forever. 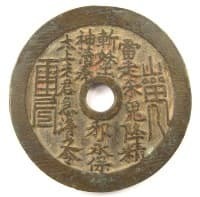 The reverse side expresses a wish for good fortune and happiness. The Taoist Immortal is Zhong Kui (钟馗) with a sword in his right hand. He is famous as a fearsome slayer of evil demons. The projections from each side of his hat are "demon-seeking" devices that can point to unseen and lurking dangers. The inscription is read top to bottom as qu xie jiang fu (驱邪降福) which means "Expel evil and send down good fortune (happiness)". To the left of the sword, at about the 11 o'clock position, is a bat flying upside-down. Zhong Kui is usually depicted with a bat so this further confirms that he indeed is the immortal being depicted on the charm. In Chinese, the word for "bat" (fu 蝠) and the word for "happiness" (fu 福) are pronounced the same. To say "upside-down bat" in Chinese (蝠倒) sounds exactly the same as saying "happiness has arrived" (福到). There is an additional play on words here since saying "a bat descends from the sky" (fuzi tianlai 蝠子天来) sounds exactly like "happiness descends from heaven" (fuzi tianlai 福子天来). There is a lotus design just below the loop at the top. As explained above, the lotus symbol means that expelling evil and receiving good fortune and happiness should "continue" forever. Chinese swords, sword symbols and amulets are discussed in detail at Swords and Amulets. This is a large and heavy Daoist charm with a good deal of wear. The Chinese inscription is qu xie jiang fu (驱邪降福) which means "expel evil and send down happiness (good fortune)". 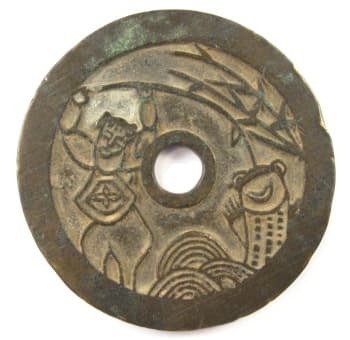 The reverse side reveals that this is another charm with Zhong Kui (钟馗), the "Demon Queller", as its theme. Zhong Kui is standing to the left of the center hole. It is difficult to see clearly because of the wear on the charm, but he is standing with his body facing slightly towards the left edge of the charm. His shoes are facing directly towards the 7 o'clock position. He is turning his upper torso so that it is facing the demon (or possibly his demon attendant) located to the right of the square hole. In his right hand is his sword. The tip of the sword can be seen just below the bottom left of the center hole. 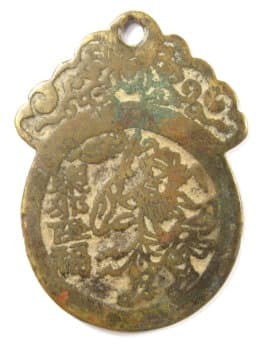 As mentioned in the description of the charm above, Zhong Kui is usually accompanied by a bat, seen at the very top of the charm, and which is flying upside down. 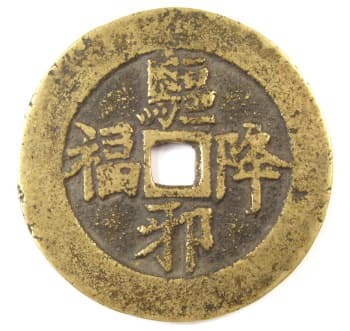 In Chinese, the word for "bat" (fu 蝠) and the word for "happiness" (fu 福) in the inscription on the obverse side have the same pronunciation. An "upside-down bat" in Chinese (蝠倒) sounds exactly like saying "happiness has arrived" (福到). The charm is 52 mm in diameter and is 3 mm in thickness. According to tradition, Laozi's real name was Li Er (李耳). The emperors of the Tang Dynasty had the same surname Li (李) and consequently traced their lineage back to Laozi. Daoism (Taoism) was officially promoted during the Tang and in 666 AD Emperor Gaozong deified Laozi (tai shang lao jun 太上老君) with the title "The Supreme Emperor of the Mystery Prime" (xuan yuan huang di 玄元皇帝). Emperor Xuanzong, also known as Emperor Ming (Minghuang), was even ordained as a Daoist priest and during his reign ordered that Daoist temples be established throughout China and that every household should own a copy of the Dao De Jing. The inscription on the charm at the left reads yuan tian shang di (元天上帝) which translates as the "Supreme Lord of the Primal Heaven". This is actually a reference to a proclamation by Emperor Xuanzong in 754 further exalting the status of Laozi with the almost identical expression xuan tian shang di (玄 天上帝) which means the "Supreme Lord of the Dark (Mysterious) Heaven". The only difference is that the first Chinese character xuan (玄), meaning "dark" or "profound", has been changed to yuan (元) which means "first" or "primal". The inscription was changed because it was a cultural taboo to write the name of an emperor and in this case the emperor was Xuanzong. 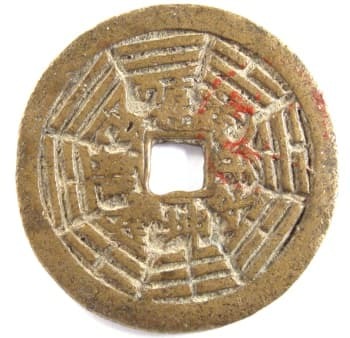 The reverse side of the charm displays the bagua or eight trigrams. You may notice that parts of this side show traces of red. Red is considered a very auspicious color by the Chinese who sometimes further enhance the amuletic effect of charms with the addition of red paint. This charm has a diameter of 39 mm and a weight of 12 grams. Hanshan (寒山), also known as "Cold Mountain", was a Tang Dynasty poet whose poems reflected both Daoist and Buddhist (Chan, Zen) themes. He is believed to have been a lower level official in the bureaucracy who fled to the mountains to live as a hermit during the An Lushan Rebellion. 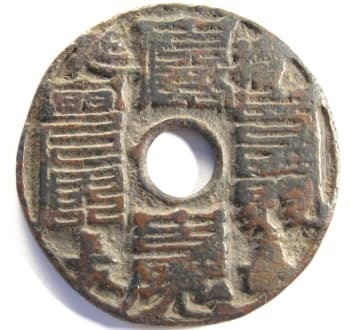 The An Lushan Rebellion, also known as the An-Shi Rebellion (安史之乱), occurred during the years 755-763 of the reign of Emperor Xuanzong (Emperor Ming, Emperor Minghuang) mentioned in the description of the above charm. Emperor Xuanzong was so enamored with his beautiful concubine Yang Guifei that he neglected his official duties resulting in popular discontent and a revolt led by one of his generals, An Lushan (安禄山). Very little is known of Hanshan's life. He was an eccentric who saw things and lived life in a manner probably more similar to Laozi (Lao-Tzu 老子) and Zhuangzi (Chuang Tzu 庄子) than the Daoist and Buddhist monks that inhabited the temples of the time. Essentially all we know about him comes from the exquisite poems he left behind written on rocks, trees and temple walls. At the left is an example of a Hanshan charm. The inscription at the top of the charm reads han shan bi you (寒山庇佑) which means "Hanshan protect" or "Hanshan bless". 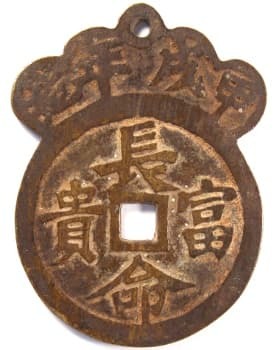 The four character inscription surrounding the square hole is qu xie fu zheng (驱邪辅正) which translates as "expel evil and assist the upright (righteous)". 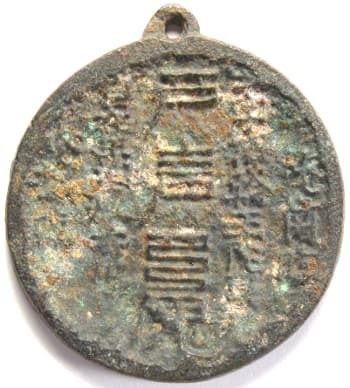 The inscription at the top of the reverse side of the charm is jia xu nian zao (甲戌年造). Jia xu (甲戌) is the combination of one of the Ten Heavenly Stems and one of the Twelve Earthly Branches the traditional 60 year Chinese calendar uses to identify the year 1874. The inscription thus reads "made in the year 1874". The four character inscription on the lower portion of the charm is chang ming fu gui (长 命富贵), meaning "longevity, wealth and honor". 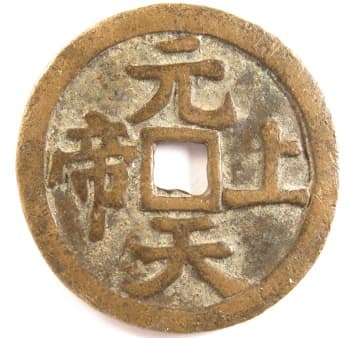 This is one of the most frequently seen inscriptions found on Chinese charms. Hanshan charms have traditionally been cast in Jiangsu Province (江苏) where there is a Hanshan Temple (寒山寺) located in the city of Suzhou (苏州). A number of Hanshan charms have also been found in Guangxi Province (广西). This charm has a length of 57.5 mm, a maximum width of 43 mm, and a weight of 19.5 grams. This is the obverse side of another Taoist (Daoist) charm with a loop which means it was meant to be worn on a necklace or on the waist. The inscription is read from top to bottom and right to left as jiang fu bi xie (降福避邪) which means "send down good fortune and keep away evil". The reverse side has the eight trigrams or bagua with a taiji (太极) symbol at its center. 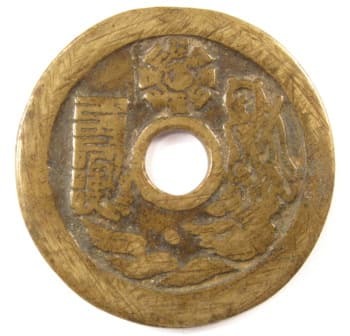 The Chinese also produced bronze mirrors with Daoist charm characteristics. At the left is an example of an old bronze mirror with the inscription written in Daoist "magic writing" script. This Daoist mirror is discussed in detail at Chinese Daoist Mirrors.